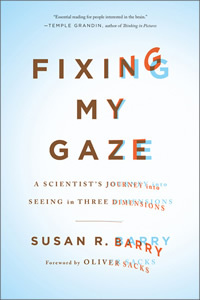 Dr. Susan Barry writes the blog "Eyes on the Brain" at psychologytoday.com about the eye-brain connection. She is the author of the popular book Fixing My Gaze about how optometric vision therapy cured her stereo-blindness allowing her to see in three dimensions for the first time in her life. She wrote about her father who decided to quit driving in his early eighties. Dr. Barry noticed that over the next couple of years her father's life dramatically changed by contracting to the point where her father barely left the house. He was also becoming withdrawn and upset. Dr. Barry noticed that her father kept squinting his left eye shut. She wondered, "Could my father be squinting his left eye because it was turning in? If so, the left eye would be aimed at a different place in space than his right, providing his brain with confusing and conflicting visual input." I thought back to a story my father had told me about his days in the Air Force during World War II. Since he was an artist, he had been assigned to interpret aerial photographs. Sometimes, he’d be given stereo pairs of photographs which he viewed through a stereoscope. While he could see the 3D in the images, he told me that his sense of the 3D was not as good as others. Perhaps, he had always had subnormal binocular vision. When he stopped driving, he no longer needed to look in the distance. Indeed, he rarely looked further than the walls of his tiny house. Without driving, he had lost the ability to keep his eyes aligned, especially for distance viewing. Eye alignment, I concluded, was not a strong suit in our family. So, one afternoon, during a typical visit, I sat about five feet from my dad and asked him, quite casually, how many heads did I appear to have. My father studied me for a while and then responded with great surprise: “You have two!” He could still read without the letters doubling, but when we gazed out the window, all the objects outside appeared double. He hadn’t noticed this previously, but, then again, he had avoided looking out. No wonder, my father was reluctant to take a walk with me. His perceptual world was thrown into confusion. Dr. Barry then took her father to a developmental optometrist who diagnosed him with esotropia - a condition in which one eye turns in toward the nose. Since her father's two eyes were not pointing at the same object, double vision and poor depth perception resulted. The optometrist fit Dr. Barry's father with specially designed prism glasses that bent light in a way that compensated for her father's turned eye. As Dr. Barry notes in her post, falls are a leading cause of serious injury in seniors and people with poor depth perception are much more prone to falls than the general population. When you combine old age and poor depth perception, you may have a recipe for disaster. It's a good idea for seniors to get comprehensive binocular vision eye exams. Not all optometrists test binocular vision and patients and their care-givers need to ask the right questions of their doctors to ensure that the right tests are being done. To find a developmental optometrist visit the website of the College of Optometrists in Vision Development.